The fantastic Cassetteboy will also be playing, alongiwth the legend that is DJ Rubbish. 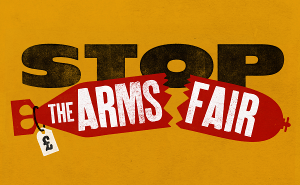 Suggested donations for Campaign Against Arms Trade on the door – £5 unwaged/£10 waged/£20 loaded. Nearest DLR is East India, and Capstan House is across the footbridge. SET is on the 7th Floor, Capstan House: use the right hand lift shaft. Enter the floor through Door 1 and turn right for the project space. Free – booking advised. Register on Eventbrite. Find out more at artthearmsfair.org. Join and share the event on Facebook.